When I was in high school I lived across the street from a Poppin’ Fresh, which is now known as Baker’s Square. 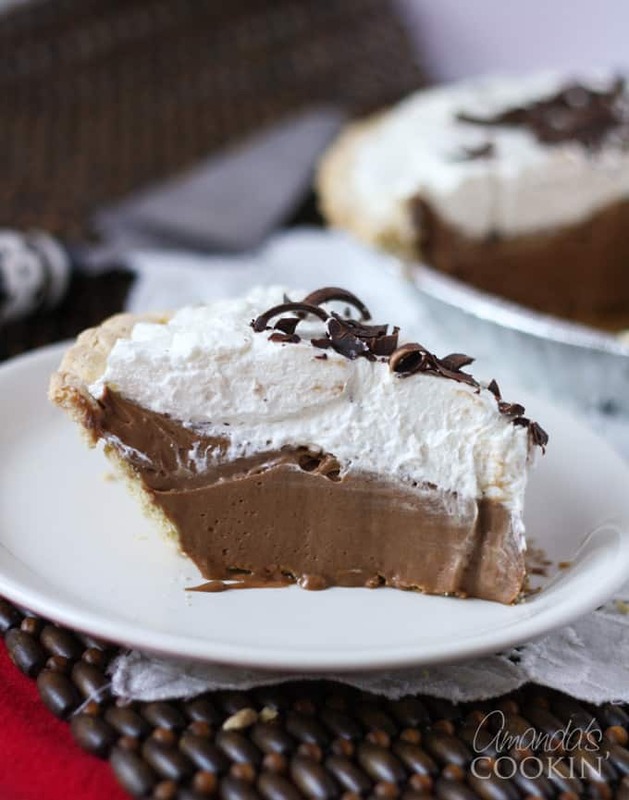 They make the BEST French Silk Pie, which is a rich and creamy chocolate cream pie. Yes, they beat out Marie Callender’s by a mile. I have been making this pie every Thanksgiving and Christmas since 2008. 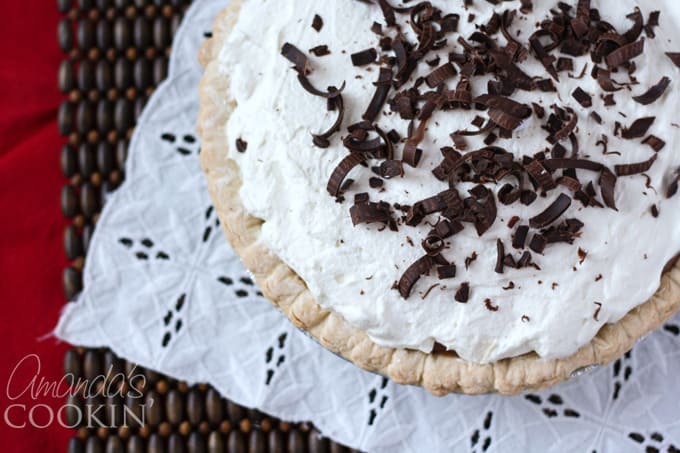 There isn’t a Christmas or Thanksgiving that goes by without this my French Silk Pie, and chances are we’ll be enjoying it for Easter too. It’s just a family favorite and there would be a lot of sad faces if I didn’t make it! I originally discovered this recipe on a blog called Sticky Feet. Can’t thank her enough for sharing this French silk pie which has become a family tradition around here! From my original blog post: “I have to admit, I was so excited to make this, and then so worried it wasn’t going to work because the instructions said to beat the butter and sugar until creamy and not grainy. Well, mine was creamy but never NOT grainy. However, after making this multiple times now, I know to simply beat it for several minutes until light and fluffy, about 6-7 minutes.” The sugar melts in the rest overnight, so be sure to include that step. You won’t be disappointed! For this recipe, I used my KitchenAid stand mixer with the paddle attachment. First off, make the filling first. The filling will be pale in color but will darken as it chills. Put it into a bowl, cover with plastic wrap and refrigerate. This allows it to set up and thicken a bit before adding it to the pie shell. Cool the chocolate. Melt the chocolate as instructed and let it cool completely. I usually melt the chocolate first so it’s cool by the time I need to add it to the filling in the mixer. If you add vanilla to hot or warm melted chocolate it may seize up. Make your pie crust. If making a crust from scratch, follow the instructions for a fully baked pie shell as this pie will not go in the oven. Let it cool completely. Add the chilled filling to the pie crust. Put it back in the fridge while you make the whipped topping. 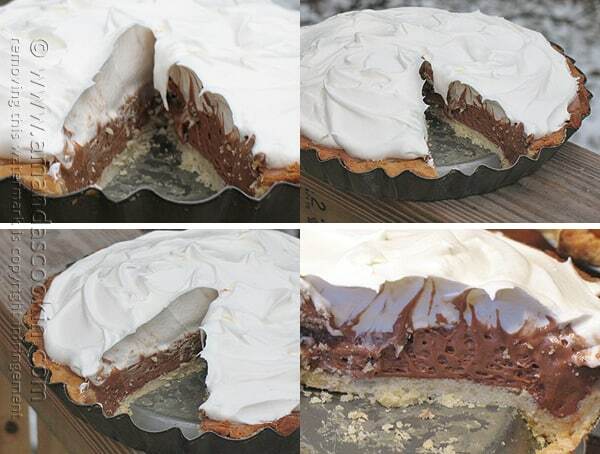 If you are using Cool Whip, go ahead and top the pie now and refrigerate. WAIT until tomorrow to eat. You can certainly eat it after it has chilled for several hours, BUT believe me when I tell you that you will be very thankful that you waited overnight. The filling needs time to set up. Any graininess you may have detected when you tasted the filling will be gone after a good night’s rest. NOTE: the eggs in this recipe are not cooked. If that concerns you, you can use pasteurized eggs or learn how to pasteurize the eggs in your fridge. 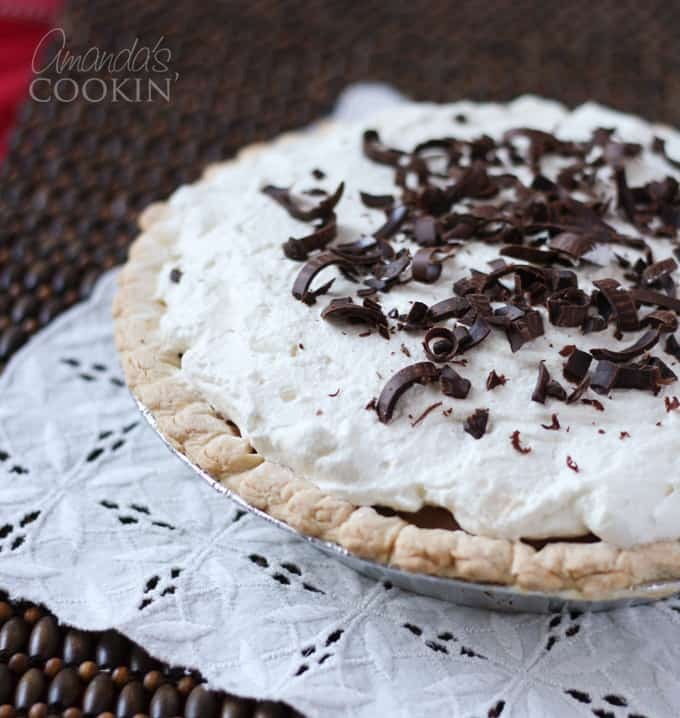 I have made this French silk pie numerous times and have used both Cool Whip (pictured in the original photos) and fresh whipped cream (as seen in these updated photos) for the topping. You can dress it up by shaving some bittersweet chocolate through a mandolin or by using a vegetable peeler. Sprinkle the shavings on the top of the pie. 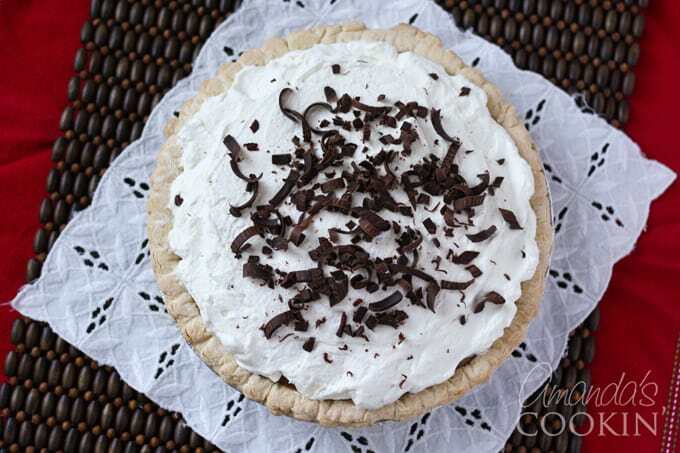 Check out the video for this delicious French Silk Pie below! 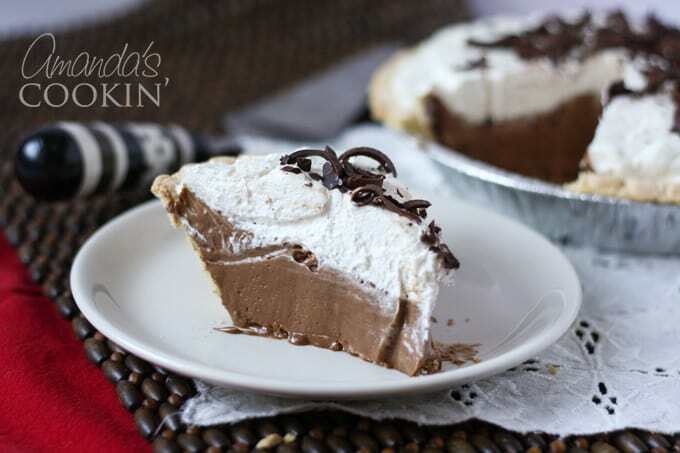 This French Silk Pie tastes just like the one you love from Baker's Square (formerly known as Poppin' Fresh!). Bake a homemade pie crust or use a Pillsbury refrigerated crust and make according to package directions for a fully baked crust. Set aside to cool. Add eggs, two at a time, beating a full 5 minutes after each addition. The eggs in this recipe are not cooked. If that concerns you, you can use pasteurized eggs. This post originally published here on December 6, 2008, then republished October 8, 2016. I made this last night and I can’t for the LIFE of me figured out what happened :(( I made sure everything was cooled. Added eggs 2 beat for 5 minutes. Added an egg beat for 5 minutes added the 4th egg and beat for 5 minutes. (Someone else said they did this.) The only thing I can think of is that the batter did not chill and rest for long enough. It was about 30 to 45 minutes before I put it in the crust. Chilled it covered overnight. Complete soup… a runny pudding :( the flavor was PHENOMENAL!!!! It was so rich and even had a fluffy texture. It would have been easily been just as good as Bakers Square if I could get it to set… I really want to try it again. Can you give me any help? Hi Jodi. First I apologize for not seeing this comment sooner :( I’m not sure what might have gone wrong without knowing everything. Are you sure you had the right amount of sugar and butter? The eggs should be added two at a time, I don’t know if beating them too long could have been the undoing. I’m so sorry you had trouble. This pie was SO DELICIOUS!! 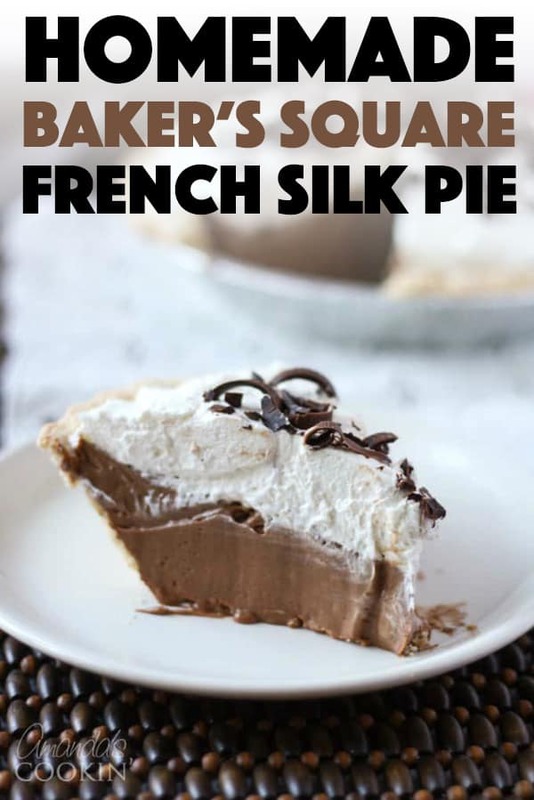 My husband is from the Chicago area and grew up eating French Silk Pie from Baker’s Square. Since we moved to Texas he has always whined about not having Bakers Square. I tried this recipe at Christmas and he was so happy! I made it 3 times during Christmas & New Years because we couldn’t get enough! (Yes, we gained a few pounds!) The only thing I struggled with was the chocolate gettting kind of hard when it cooled. Then there were tiny chunks of chocolate throughout the pie. Did I do something wrong? Thanks!! Hi Catherine! First of all, so glad you guys loved it! 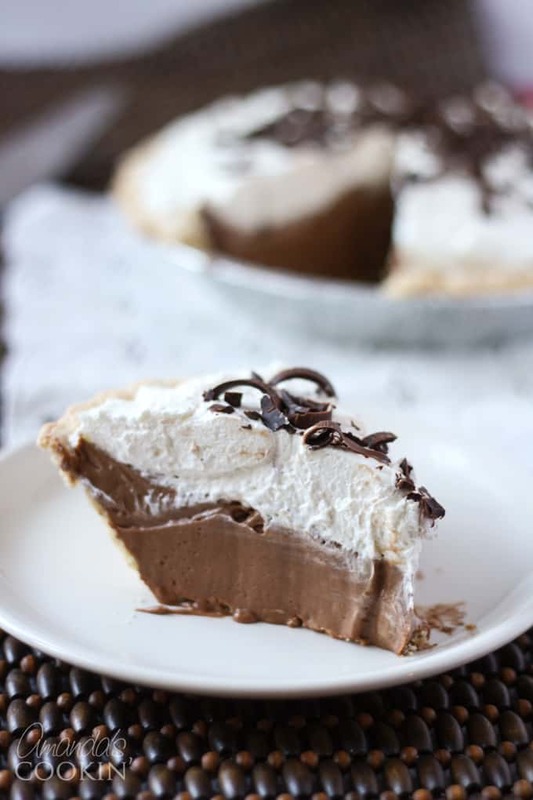 I grew up in the Chicago area too and had been eating this pie since they were Poppin’ Fresh :) For the chocolate, I usually melt it in the microwave. I start with one minute then stir, then switch to 30 second increments. I don’t let it melt completely. Heating it too long can cause the chocolate to seize up. When there are some small pieces left, I stir and stir until they are all melted. The heat from the melted chocolate is usually enough to melt the remaining pieces. Then I start working on the pie. Once it’s time to add the chocolate it has usually cooled enough to add it safely. Are you using the unsweetened chocolate as listed in the recipe? Sugar in the chocolate can make it solidify, so it’s important to use the unsweetened chocolate. I usually use Ghirardelli or Baker’s brand. Hope this helps! I made this as a dish for Thanksgiving and it was amazing! I made it gluten free and my family absolutely loved it! Thanks for the recipe! Do you use baker’s unsweetened chocolate? Yes that will work great! Is that the kind you used? I looked at Baker’s chocolate and there is a few different kinds. Thanks! 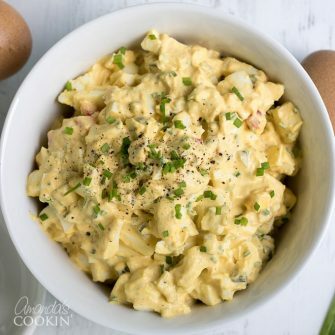 Would this recipe work using meringue powder in place of the raw eggs? Question: This pie is best the next day, but what about the day after? Trying to figure out how far in advance I can make this for Thanksgiving! This will be my 8 year old daughters first time making something to bring! Yes excellent the second day too! We’ve feasted on ours over a 4 or even 5 day period. But the whipped cream starts to break down after that. Looks so luscious and delicious! YUM! Hi Amanda, I love baking and I will surely try this pie. I’ll let u know how it turns out. PS..I have chocolate mouth lovers in my family and I’m sure this will be a knockout! I made this pie yesterday. It was the first time and it turned out beautifully. I read some other pie recipes and took some pointers and applied it to this recipe. Here they are: I creamed the sugar and butter in a glass bowl, added the chocolate and vanilla, then transferred the mixture into a stainless steel bowl that i had kept cold in the freezer. I added one egg at a time and beat each egg for five minutes. I let the batter rest for five minutes between each egg and put the stainless steel bowl in the fridge to keep it cold. I noticed by the time the third egg was added, it really started to fluff up. It was set in a couple of hours and smooth as silk. I just want to verify that it really is only 2 ounces of the chocolate? I only use a high quality chocolate but there wasn’t a strong chocolate flavor. After some research I added 2 more ounces and it was perfect. Should the eggs be cold or room temp? Yah I figured that out after we added them, some of the chocolate seized to the side of the mixing bowl. Will make sure next time. I just made this and it turned out AMAZING! ? So glad you loved it like we do! hi Amanda, I have a question I just made this pie and before putting it in the fridge it looked a bit more on the liquidy side (not super super runny though) as it has been in the fridge for about 30 minutes it´s starting to look a little more solid, do you think it´ll turn out fine? thanks! I’m sorry I’m just seeing this? How did it tun out? Amanda, can I make this a few days in advance ? Looks amazing, thank you. 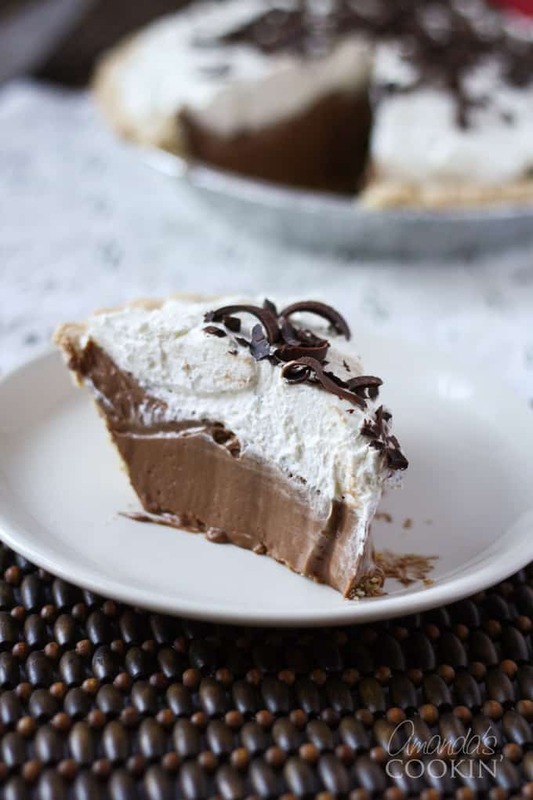 You’ve got me so excited – my absolute favorite dessert growing up and a birthday staple was Baker’s Square French Silk Pie (and NO, a Marie Callenders chocolate cream was not the same…) and I literally can’t get it any more on the west coast. Even drove an hour to a place claiming to have french silk pie still for one of my recent birthdays and was disappointed to get a regular chocolate cream. In desperation I tried making it one year but had the same experience you described — tried beating it with electric beaters for almost an HOUR but it remained grainy. I’m not much of a baker so I thought maybe it was just beyond my skills. If I can make this recipe and have my childhood back I will cry! Hi Maddy! 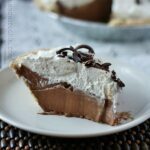 You will LOVE this pie, I promise!! I swear by it.